Petrol price was today hiked by 75 paisa per litre and diesel by 50 paisa a litre as rupee hit 11-month low making oil imports costlier. The increase in rates, which are excluding local sales tax or VAT, will be effective from midnight tonight, Indian Oil Corp, the nation's largest oil firm, said. 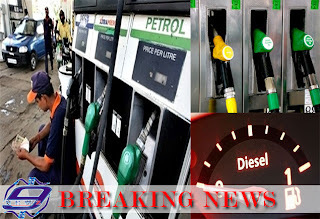 Petrol price in Delhi was hiked by 90 paisa to Rs 63.99 a litre from Rs 63.09 currently, while diesel will cost Rs 50.25 per litre from tomorrow as against Rs 49.69 currently. Also, the oil companies cut price of cooking gas (LPG) that consumers have to buy beyond their quota of nine subsidised cylinders in a year, by Rs 45 per bottle. Non-subsidised domestic LPG in Delhi will now cost Rs 802 per 14.2-kg cylinder as against Rs 847 currently. The petrol price has been hiked for the first time in last 3 months - with last being done on 1st March 2013. For diesel, this is the fifth increase in rates this year. Petrol in Mumbai will cost Rs 70.68 a litre from tomorrow as against Rs 69.73 currently, while diesel prices was raised by 62 paisa to Rs 56.66.